Hard disks may not be the hottest or most exciting storage technology any more, but they're not done for yet, at is clear from the ST600NM0024. It's one of the best drives we've ever used - it's fast and offers oodles of capacity. 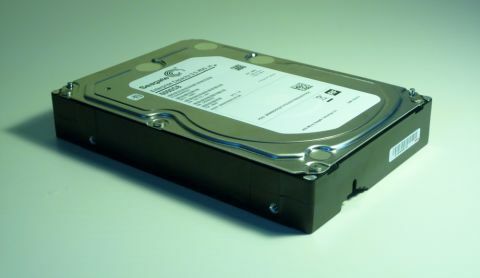 A single hard disk offering a mind-bogging total storage capacity of 6TB (6000GB) is a new milestone for computing, and it has been reached almost simultaneously by two firms, Seagate and HGST, a subsidiary of Western Digital. Previously, the maximum capacity 3.5-inch hard disk you could buy only offered 4TB, so this is a whopping increase of 50 per cent. Both companies announced the new capacity late last year, so it has clearly taken a while for the drives to arrive at retail. Both are aimed at enterprise customers, and both are priced around £450 (US$664, about AU$717), which works out as 7.5p per gigabyte. The current high price is understandable at this stage, since the drives are so new, with a lot of research costs to be paid off and without the economies of scale yet provided by full manufacturing efforts. Considering a 4TB drive is hovering just over £100, that's a big markup. Rest assured, 6TB drives wont stay at this high price for long, which will be good news for just about everyone. With this much storage, there's the potential to replace an entire power-guzzling array of individual disks with just one, or to simply add a whole lot of additional capacity to a NAS or desktop PC. The Seagate Enterprise Capacity 3.5 HDD V.4 also comes in smaller versions, including 5TB. The secondary title with the oh-so-catchy name ST600NM0024 differentiates this vanilla 6TB SATA model from variants that come with a 12GB/s SAS interface and built-in disk encryption. All capacities spin at 7200RPM, and come with 128MB of cache. Power consumption varies depending on the drive capacity and number of platters. With the 6TB drive, Seagate rates it as 6.9w idle, with 11.27w in use. There's also the option with some models of Advanced Format 4Kn support, which means the physical sectors are 4KB instead of 512 bytes, leading to greater efficiency when dealing with large files. Another option is built-in drive encryption, according to level 2 FIPS 140-2 validation. This provides a secure erase function, when using the drive in conjunction with Seagate's Seatools Windows software. Unlike secure erase on SSD, it doesn't wipe the data, but instead changes the encryption key. Perhaps when used in conjunction with other data wiping tools, such as multi-pass overwriting, it should be a fairly effective way for IT administrators to ensure data is inaccessible.